Lionsgate has released a new teaser for John Wick 3: Parabellum, which brings with it the promise of a full-length trailer reveal this Thursday. Keanu Reeves started his journey as this legendary and formidable assassin five years ago with the first John Wick, a movie that managed to sneak up on seemingly everyone. Now, we're going to see Mr. Wick literally fighting for his life in the upcoming third installment, with our first real look at that fight coming our way in just a couple of short days. As for this teaser, it doesn't give us all that much. We see some quick cuts of well-armed masses gearing up to try and get the very massive contract that's been put on John Wick's head. We see the man himself running through the streets of New York City, literally trying to get away with his life after being excommunicated from the assassin's order, given that he killed on the ground of The Continental hotel. 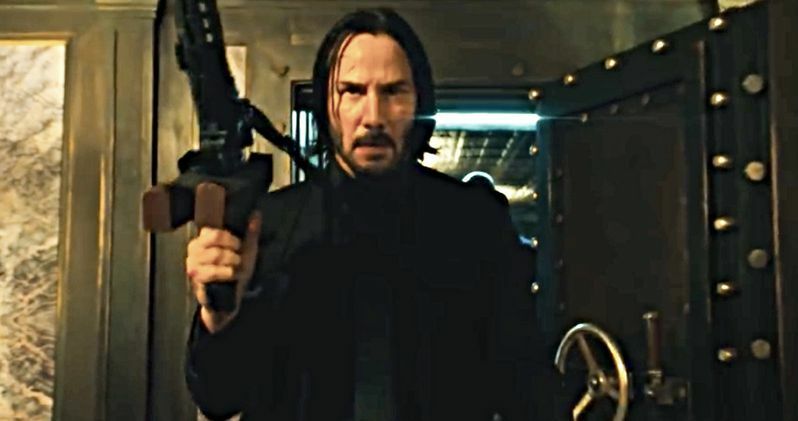 But with the final shot, which sees Keanu Reeves looking extra angry, gun in hand, it's clear that he's not going down without a big, bloody fight. One can only imagine what madness awaits with the full trailer this Thursday. What we know for sure is that director Chad Stahelski has promised there will be an even higher body count this time around, when compared to previous entries. And that's really saying something. We also know that we're going to see some familiar faces returning this time around, as we get a quick glimpse of Laurence Fishburne as the Bowery King in this brief teaser. We've also get Ian McShane returning as Winston, amongst others who we met in the first two chapters. There are also going to be some new faces along for the ride in John Wick 3. Oscar-winner Halle Berry is going to play a big role in the events set to unfold this summer. She doesn't appear in the teaser, but we'll surely see her in the full trailer and get a better idea of how she fits in. There's also Anjelica Huston, who is playing a new powerful figure known as the Director. Asia Kate Dillon, Mark Dacascos, Jason Mantzoukas, Tiger Hu Chen, Yayan Ruhian and Cecep Arif Rahman are also on board for the new installment. The first John Wick was released in 2014 and grossed a relatively modest $88 million at the box office. However, great reviews and very positive word of mouth propelled John Wick: Chapter 2 to a much better $171 million take in 2017. Will that upward trend continue? We'll probably have a better idea of that once we see the full trailer this Thursday, which we'll be sure to bring your way as soon as it's made available. John Wick 3 is set to arrive in theaters on May 17. While we wait for that, be sure to check out the new teaser from the Lionsgate Movies YouTube channel below.